Premium cable content from HBO comes to the iPad at last, as the network on Friday released its long-awaited HBO Go app for iPhone and iPad. The app brings both HBO original series as well as hit movies to Apple’s iOS devices, but there is a catch: Unless you’re already an HBO subscriber with a participating television provider, you’re out of luck. 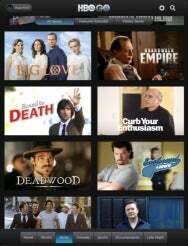 In addition to currently airing programs like Boardwalk Empire, Game of Thrones, and True Blood, HBO Go also provides access to a backlog of older programs, like Deadwood, The Wire, and the recently concluded Big Love. In addition, there’s access to bonus features and behind-the-scenes extras, and the app supports video over both Wi-Fi and 3G connections, so you can fire up your favorite show, no matter where you are. A customizable Watchlist feature lets you mark programs you want to view later, and you can set up a Series Pass to automatically populate it with shows you’re following. Of course, those looking to follow HBO’s series without subscribing to the preimum channel are still stuck. The network doesn’t provide à la carte access via its app (or its Web-based streaming service), and as its shows aren’t available in the iTunes Store while airing, you’re pretty much consigned to wait until the season is over—unless you want to pony up for an HBO subscription. That’s a shame, too. Given HBO’s status as a premium channel with its own subscribers, it seems as though the network could stand to make a killing by offering streaming access to users without cable subscriptions, or those who don’t want to pay for all of HBO’s content. The channel has long proved that its programming alone can drive sales, so it would seem only natural that it push that envelope into the digital realm and shake off the shackles of the cable providers. Such a day may still come eventually, but it doesn’t seem like it will be today. HBO Go requires a device running iOS 3.2 or later.